Today’s otter comes courtesy of the Sunshine Coast Daily. Mo and Bud, small-clawed south east Asian otters from Underwater World, are on their way to New Zealand for what the Daily calls “a breeding holiday”. Cuddly though these critters may look, she said the venue is unique in a special way. 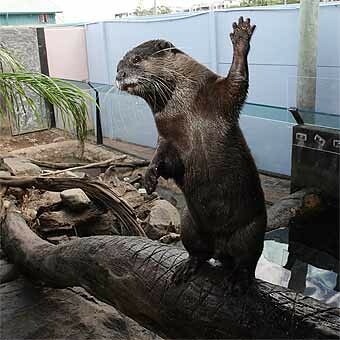 “Otters are dangerous,” she said. “They are one of the most dangerous creatures in zoos; very few zoos’ staff would even allow hand-feeding. Is thata Marshal amp behind him/her on the right? Dangerous indeed.